I had wrapped up a shoot with a client and pre planned to drive into Conshohocken, Pa for some personal photogging. So yesterday, I thought it would be one of those days where I could drive up there, park, and then walk around in the area. A St Patrick's Day celebration with parade and all!! This was "music to my eyes" and the potential for some nice shots. 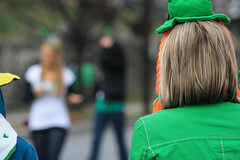 It was a festive occasion, the streets teaming with presumably folks proud of their Irish heritage.